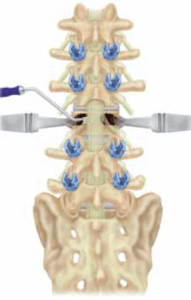 Vertebrectomy is the surgical resection of most of the vertebra. It is a more radical procedure that involves removal of all the posterior elements (spinous process, lamina, facet joints and pedicles) and the majority of the vertebral body. It is most commonly performed through a posterior approach and used for spinal deformity correction, especially sagittal malalignment with severe kyphosis and scoliosis and tumor resection. It is a complex, high risk procedure that completely destabilizes the spine (thereby allowing major deformity correction) and requires extensive anterior reconstruction and posterior stabilization and instrumentation. Who is a candidate for Vertebrectomy? Vertebrectomy has been used to treat patients with severe kypho-scoliotic deformity and tumor reconstruction. It is particulalry valuable in patients with sagittal malalignment (kyphosis) that requires substantial correction, especially if the deformity is located in the lumbar spine or anatomy/prior fusion prevents the use of less radical osteotomy procedures. It is also used in tumor cases that require radical resection. Vertebrectomy was initially described as a combined approach with anterior resection of the vertebral body and anterior column grafting followed by posterior resection, fusion and instrumentation. More recently an all posterior approach has become more popular as it avoids the morbidity associated with the anterior approach. The spine is approached posteriorly and pedicle instrumentation placed across the regions necessary for deformity correction and stabilization. 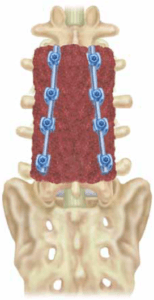 The specified vertebra is exposed and the spinous process, lamina, and facets removed. The lamina 1 level above and below are also removed to prevent kinking of the neurologic structures following correction. The pedicles of the involved level are then resected to their base at the posterior vertebra while protecting the exiting nerve roots. A temporary rod is placed for stability prior to resection of the anterior column. 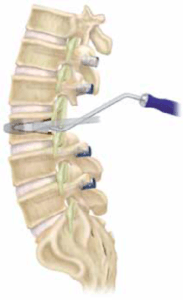 Subperiosteal dissection of the vertebral body is performed and retractors placed. The amount of bone needed for the planned correction is then removed with osteotomes, curettes, and reamers. In vertebrectomy this includes removal the discs above and below to the endplate of adjacent vertebra and resection of the anterior wall with drill and kerrison rongeurs. An anterior cage is placed to prevent over shortening of the anterior column and create a biomechanical pivot for deformity correction. Temporary rods are used to stabilize the spine during deformity correction and the dura carefully inspected to ensure no neurologic compression. Neuromonitoring is performed to confirm no new neurologic changes; if stable definitive instrumentation and fusion with bone graft completed. Blood pressure, Hgb level, and oxygenation should be maintained to ensure adequate neurologic perfusion. What are the pros and cons of Vertebrectomy? Vertebrectomy provides excellent correction of severe spinal deformity but it is a complex spinal reconstruction with significant risks. Thes include but are not limited to infection, neurologic injury, dural tear, instrumentation failure, non union (pseudo-arthrosis), chronic pain, DVT, PE, chronic pain, and need for revision surgery. Each patient is unique and only a comprehensive evaluation with a fellowship trained spine surgeon can give you the best appreciation of the risks and benefits for surgical treatment of your condition.